This is the second Sof Drink product we’ve reviewed, the first being the Champagne Cola, which I haven’t had the pleasure of tasting. As I’ve said before, I’m not the biggest cream soda fan in the world but this looked different so I figured I’ve give it a try. Although the cat on the bottle is pretty cool I swear it had nothing to do with it. I like this though, I think it’s the second best cream soda I’ve tasted, number one still being Virgil’s. It doesn’t have the vanilla kick and creaminess that the Virgil’s does, but it does have a crispness to it, which is very rare in a cream soda. 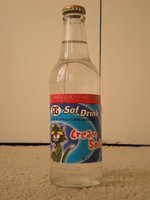 It was almost like a cream soda combined with just a bit of seltzer. Just enough “watered down” flavor to make it a bit milder and not as “sticky” as other cream sodas. This is pretty important to me as I really dislike cream sodas that are heavy and sticky. Call me crazy but I swear that it had a slight undertone of a citrus flavor. This one was about $1.50 for a bottle, so not too crazy. I liked this one and would drink it again.